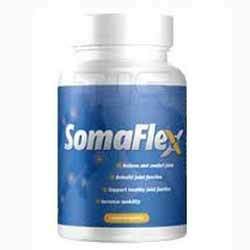 Somaflex Review – Is This Product Safe To Use? Somaflex is a product that is designed to help relieve the pain caused by aging and degenerated joints. The product, which is completely natural, is sold through the informative and well-designed official website and is offered at a risk-free trial. According to the information on the website, there are millions of Americans suffering from joint pain and it identifies some of the causes including past injuries, old age or certain conditions such as osteoarthritis and rheumatoid arthritis. Unlike some Joint pain relief brands, the manufacturer of Somaflex shows details of clinical trials that the ingredients in the formula have undergone, plus a number of customer testimonials. All ordering information is provided and while one bottle of Somaflex costs $39.99, slightly higher than most products of this type, there are discounts given on larger orders. What are the Ingredients Used in Somaflex? Glucosamine, Chondroitin, Hyaluronic Acid, Univestin, Pycnogenol, White Willow Bark, Turmeric Root. The product formula details for Somaflex are fairly limited, and the only list of ingredients is found in a diagram that compares Somaflex to other brands on the market. Most consumers of joint pain treatments will be familiar with some of the ingredients such as Chondroitin and Glucosamine which are commonly used to repair and rebuild damaged joint cartilage, and Hyaluronic acid, for its benefits in increasing the amount of lubrication around the entire joint. Two lesser known substances in the formula include White Willow Bark, a natural version of aspirin, and the spice Turmeric, used traditionally for its ability to reduce inflammation and swelling. Apart from those that have shellfish allergies (both Chondroitin and Glucosamine are derived from shellfish), Somaflex should not cause any harmful or unpleasant side effects. What are the Pros of Somaflex? It may support joint function. Certain ingredients have been clinically studied. The ordering process online is secure. What are the Cons of Somaflex? It is not suitable for those with shellfish allergies. Somaflex is a reasonably good, standard Joint Pain Relief product, although it does cost slightly more than some comparable brands. The Glucosamine/ Chondroitin combination ensures that the user is receiving a powerful blend of joint repairing ingredients, although because the actual amounts of the substances are not disclosed, it is not known how quickly the sufferer will experience relief of pain. Over time, however, Somaflex should build up in intensity and may well help prevent future damage. However, it is recommended to research more about the product to get better results.